Pirmasens, Germany, March 16, 2015. RAMPF Eco Solutions – a leading provider of chemical solutions for manufacturing high-quality alternative polyols – is looking to impress visitors to UTECH 2015, the international specialist trade fair for polyurethane in Maastricht from April 14 – 16, through price savings over primary polyols, a reduction in disposal costs, and active environmental protection achieved by recycling raw materials. Visit RAMPF – booth 871! > Customized polyols are manufactured using PU waste materials in two of the largest multi-functional plants in Europe. The basic polyols won in this way are integrated back into the customer’s production process through either RAMPF Eco Solutions or another PUR systems house. This creates a cycle that delivers both environmental and economic benefits. > In a specially developed chemical process, PET/PSA, polyesters (PLA, PC, PHB), and renewable or bio-based raw materials such as vegetable oils are used as sources of raw materials for manufacturing high-tech alternative polyols. For customers, this means price savings over primary polyols, a reduction in disposal costs, no reliance on scarce petrochemical raw materials, and active environmental protection achieved by recycling raw materials. The company develops polyurethane systems based on its own raw materials for manufacturing molded parts for use in the fitness industry, motorcycle accessories (pannier systems, back cushions), office furnishings (chair arms), and transport containers, for example. Molded parts made from semi-rigid integral skin foam and rigid foam for prototypes, small- to medium-scale series and large-scale series (by arrangement) production are manufactured in-house. Customers can use in-house plants to manufacture their own high-quality alternative polyols, and in doing so can cut costs and reduce environmental impact – this profitable solution makes both economic and ecological sense, and is being showcased by RAMPF Eco Solutions and its project partner KEIL Anlagenbau, one of the leading providers of turnkey plants, at UTECH 2015 in Maastricht. Customized recycling facilities are designed and built for PU manufacturers with high volumes of waste material. 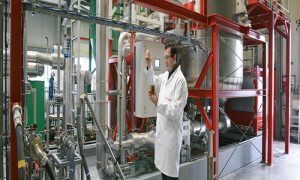 These plants enable customers to manufacture their own cost-effective, high-tech polyols at their own production location that can then be fed straight back into the production process.This cuts raw material, transport, and disposal costs, and makes the production of PURbased products more environmentally friendly.RAMPF and KEIL also design and build plants for manufacturing alternative polyols from PET/PSA and biomonomers. At this year’s UTECH, RAMPF will be a topic not only in the exhibition hall. At the corresponding trade fair conference, Dr. Frank Dürsen, Director of R&D Future and Sustainability at RAMPF, and Christian Giesker, Deputy Division Manager for Engineering at KEIL, will be giving a lecture on the topic “Manufacturing of Polyols out of Alternative Sources – Chemistry and engineering aspects”. The presentation includes, amongst others, the portfolio of polyols that are provided by RAMPF Eco Solutions and describes the modular concept for recycling plants by KEIL Anlagenbau.